Bisaria was called back by the government for consultations after the Pulwama attack. 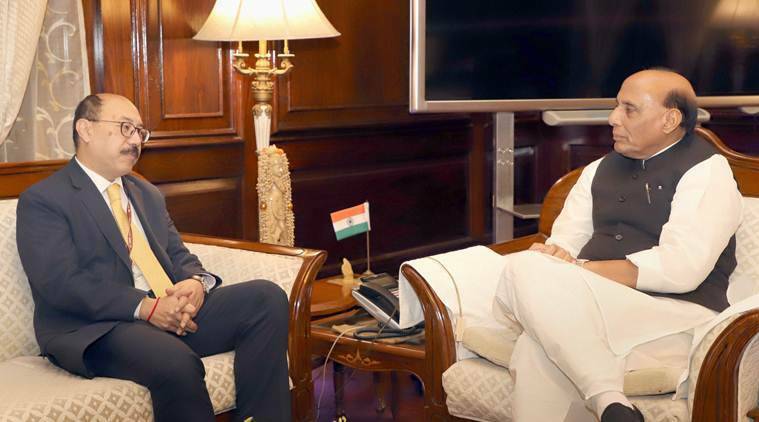 UNION HOME Minister Rajnath Singh met India’s High Commissioner to Pakistan Ajay Bisaria on Wednesday, where the latter is learnt to have briefed him about the efforts being made by India to isolate Pakistan globally in wake of the Pulwama attack. “There is no point of giving any more dossiers to Pakistan regarding involvement of Pakistan-based terror outfits in attacks here. In the past also, they have not acted on any such document. We will convince the rest of the world about Pakistan’s role in Pulwama attack,” an official said after the meeting. India’s Ambassador to the US Harsh Vardhan Shringla also called on Singh, officials said. New Delhi: The NIA has taken over the probe into the Pulwama attack following an MHA order. NIA DG Y C Modi on Wednesday visited Kashmir to take stock of the progress in the investigation.